Hi lovelies! I'm back with another 26 Great Nail Art Ideas mani, and this time the prompt is 'Christmas Preparations'. When I read the theme, I immediately thought of pulling out the decorations and putting up my Christmas tree. I did have a couple of different ideas of how to set my mani out, but this is what I settled with in the end. Read on for more info and to see how I did it! 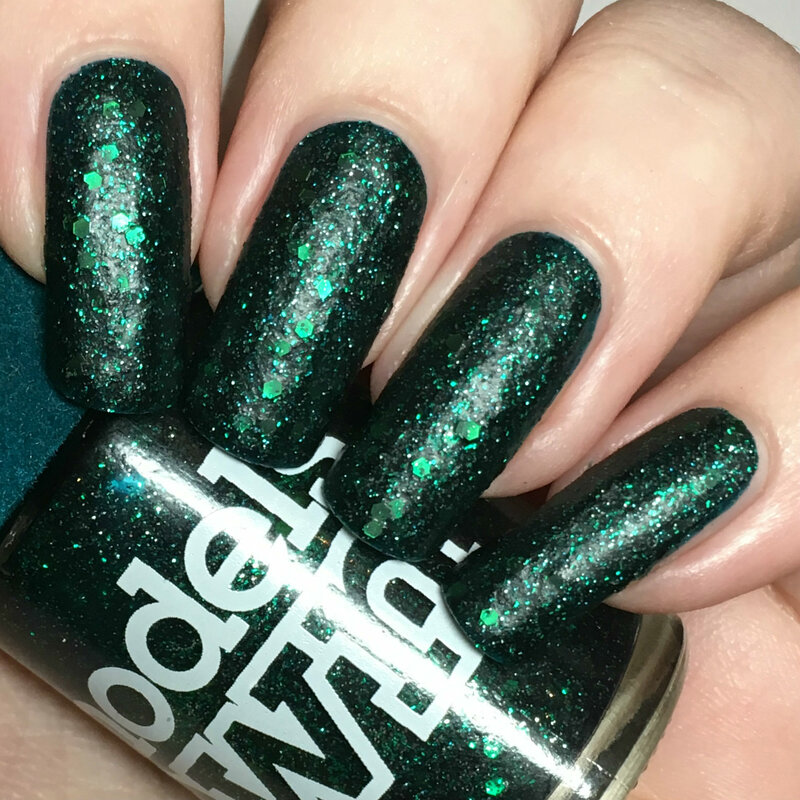 I started with a base of Models Own 'Absinthe' from the Velvet Goth collection, a deep green base packed full of green glitter. I did find the formula a bit thick, but my bottle is old (and second hand) so probably needs a bit of thinner! It is very opaque and only just needed a second coat. Below shows two coats and no topcoat - showing the matte Velvet Goth finish. I then added a topcoat to really bring out the sparkle, but also to smooth the finish ready for my nail art. Below is two coats and topcoat. 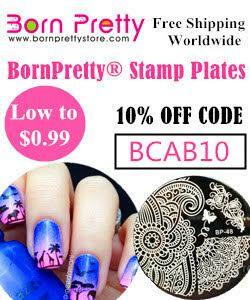 To add my Christmas lights I used MoYou London festive plate 03, a Born Pretty Store gold stamping polish (reviewed here), and my Born Pretty clear stamper (reviewed here). I picked a bright yellow gold to really make the stamping stand out. I stamped over all of my nails before adding topcoat to finish. What do you think? I'm quite happy with how this turned out, although it is a little bit darker than I had hoped. 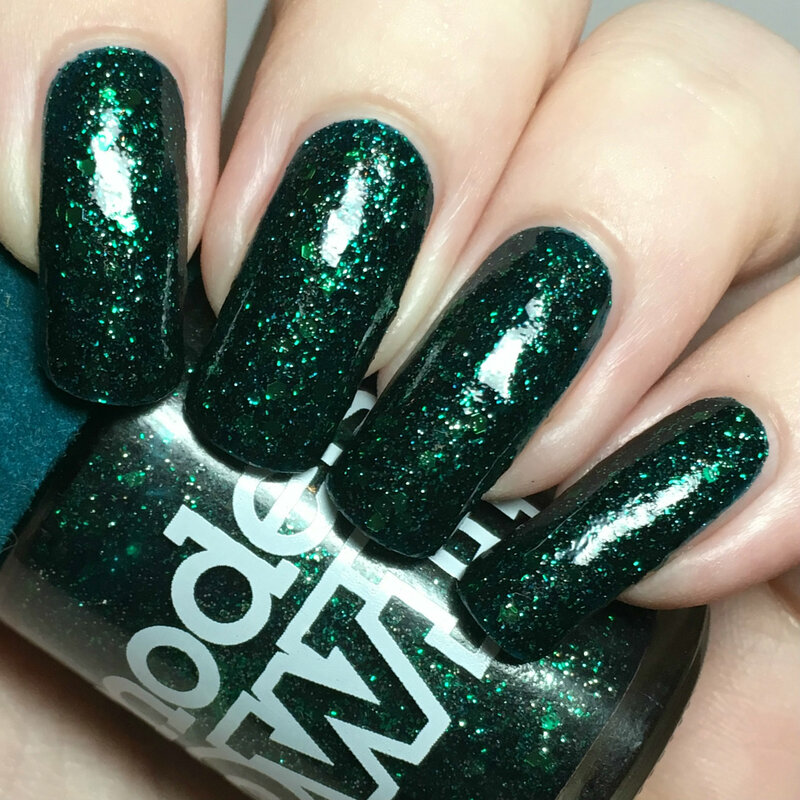 Plus, 'Absinthe' is basically a Christmas tree in bottle - especially when topcoated! 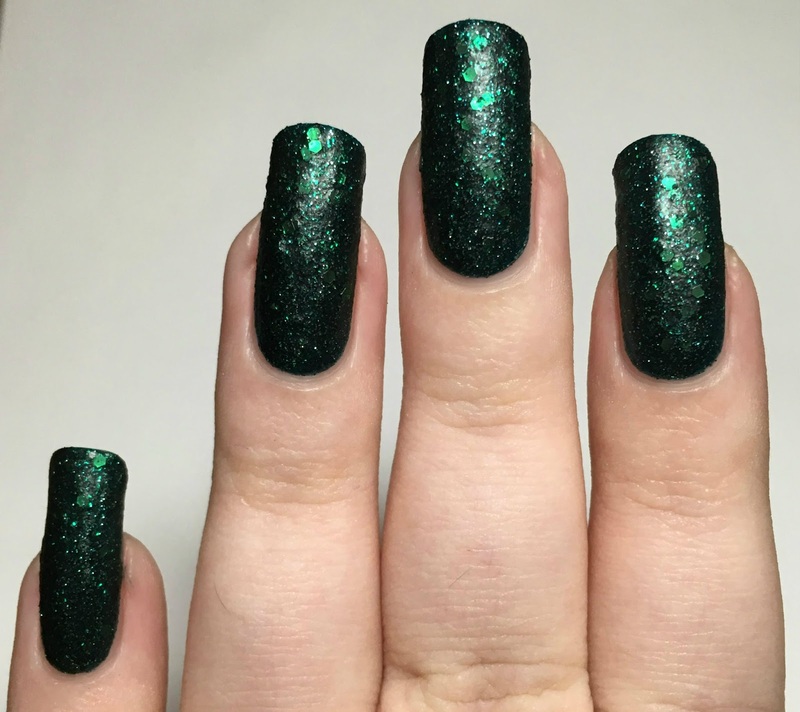 I've had this polish for forever and never used it until now. I actually put my Christmas tree up last weekend so this is a perfect mani for me right now. Have you put yours up yet? that green glitter is amazing. LIGHTS!!! 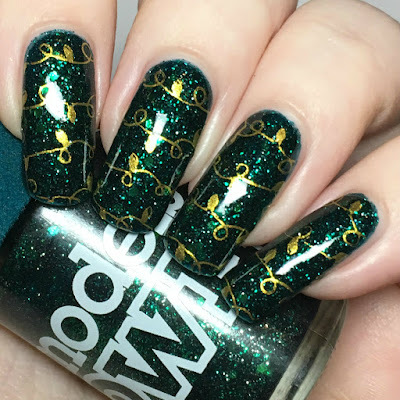 Nail art with lights are arguably my favorite! DAMN! That Model's Own polish is stunning! I love that green!!!! 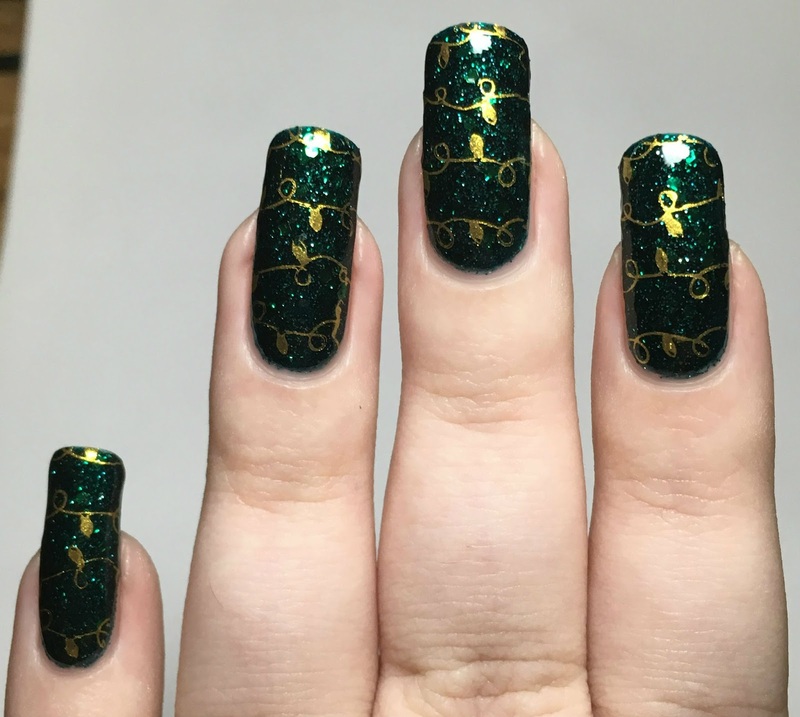 The gold stamping was the perfect addition! This is a beautiful polish and mani to boot! the base and TC is amazing! I love this - that green is just perfect! I can't get over how gorgeous your nails are! This combo turned out perfectly! I love that green polish! This combo is perfect.